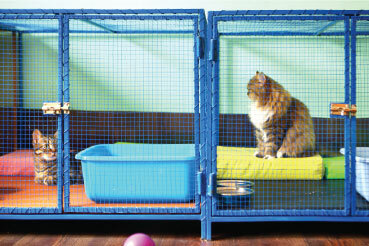 At Maroubra Veterinary Hospital we offer cat boarding only (no dog boarding) for clients. We have individual accommodation and an indoor cat play area with toys and climbing structures for those cats that are social and mix well with other cats. Our kittens that are in our adoption programme are always kept separate. Our team are on-hand to provide the best care for your cat whilst boarding with us and we can provide feed, water and cage cleaning twice daily. Specialised meals plans as well as ongoing medications can also be maintained whilst in our boarding facilities. Please contact our reception for cat boarding rates and to answer any queries you may have on 02 9344 8722. Please contact our reception on (02) 9344 8722 to book your cat in for boarding.